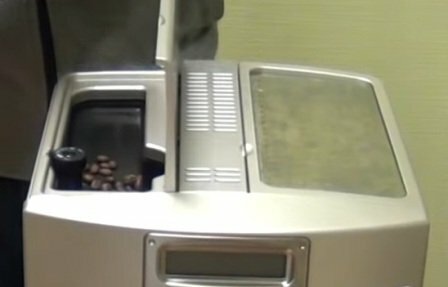 The term ‘super espresso machine’ is one that is becoming more and more common. But what exactly makes an espresso machine ‘super’? Simply put; convenience, quality and performance. These three elements are in rich supply in the Delonghi ESAM3500 N Magnifica. This machine combines the convenience of full automation with the quality of world class components. A fully customizable brew system provides coffee shop quality espresso with every shot. The automatic milk frother delivers foam for lattes or cappuccinos that would be the envy of any barista. All of this comes with the convenience of one touch programming. All in all, the ESAM3500 N is the epitome of a automatic espresso maker. Another marvel and economic model known is Magnifica 3300. It is also one of the most picked machine. The upside of a conical burr grinder is that you are guaranteed the most versatile range of grind settings available. Burr grinders are capable of producing finer grinds than their blade counterparts. Additionally, conical burr grinders are more efficient than even flat burr grinders. This means that you are ensured the best quality coffee grounds possible for your espresso beverages. The downside of the grinder is that it is built in. This prevents you from being able to access the grinder for proper cleaning. Without being able to clean the burrs, oil-heavy beans are not recommended. This is because the oils can create residue on the burrs over time. As this residue builds up it reduces the performance of the grinder. If you use oil-heavy beans, be sure to alternate to dry beans afterwards. This will help keep the burrs clear of oil residue. 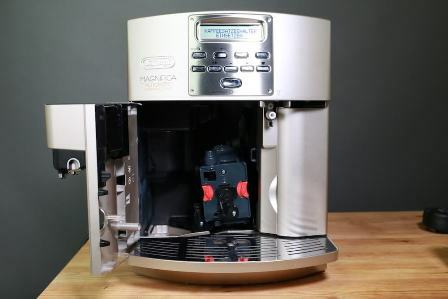 The patented Beans-to-Brew system of the Delonghi ESAM3500 N Magnifica is the pinnacle in convenient coffee brewing. Now you can get the freshest, most perfect latte or cappuccino with just a single press of a button. First, the whole beans of your choice will be ground to your preferred setting. Next, the system will brew an espresso shot to the size, strength and temperature of your choosing. Finally, the automatic milk frother will produce the perfect foam for your cappuccino or latte. Simply put, you get a coffee shop-quality beverage in the comfort of your home just by pressing a single button! A large capacity 60 ounce water reservoir provides enough water for many beverages. This makes brewing beverages for multiple people even more convenient. The built in conical burr grinder ensures top quality coffee grounds right from the start. Coffee will be ground evenly and to any degree of fineness with this conical burr design. Espresso will taste rich and creamy due to the 15 bar pressure pump in the machine. This pressure is the same as is used in many coffee shops. One touch controls make choosing brew and beverage options quick and easy. Automated alerts warn you when you need to add beans or water. This will prevent the machine from shutting down mid cycle due to running out of necessary elements. The fully customizable nature of this model makes it perfect for anyone. Choose from 3 cup size options and 5 brew strength options to make the perfect beverage every time. An auto shut off feature means you never have to worry about leaving the machine on overnight. Additionally, the unit is programmable to turn on or off at certain times of day. The double boiler design ensures that you don’t have to wait between brewing espresso and steaming milk. This makes brewing your beverage quick and easy. Dishwasher safe components help make cleanup fast and simple. Furthermore, this option offers a more thorough cleaning than just rinsing alone. A spacious 7.1 ounce coffee bean hopper means you can grind enough coffee for many espresso drinks. This is perfect for anyone who just wants to press a button and go. The cleaning and Maintenance of the Delonghi ESAM3500 N Magnifica is convenient, fast and easy. All of the removable components are dishwasher safe. This means that cleanup is as fast as removing the parts and putting them in the dishwasher. Alternatively, any part can also be quick rinsed for light cleaning. The machine has a construction of durable plastic, thus cleaning requires little more than a quick wipe with a damp cloth. Furthermore, the enclosed design of the system reduces spills and splatters almost completely. All internal cleaning and maintenance is completed using pre-programmed cleaning features. These features include a general rinse cycle designed to flush out any residue from previous beverages. Another feature descales the system, removing any calcium or other mineral deposit buildup. Automated alerts inform you when these functions need to be done, so you never have to worry about keeping track of time or beverage count. The fully automated nature of the Delonghi ESAM3500 N means the machine takes care of itself as well as you. Automatic alerts remind you to clean and maintain the machine. This ensures peak performance from the unit for many years to come. Additionally, the automated system allows you to choose from a wide range of beverage customization options. This means that you can get a coffee shop beverage to your exact taste and preference each and every time. The three main components of any espresso beverage are coffee, water and milk. Thus, a cappuccino or latte can only be as good as those three elements. 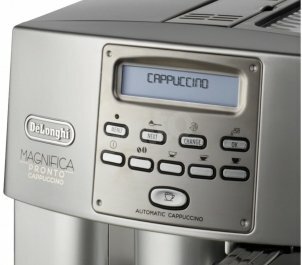 The Delonghi ESAM3500.N Magnifica ensures top quality from the ground up with its Beans-to-Brew system. A conical burr grinder will provide top quality coffee grounds, with an even, uniform consistency. Temperature and brew strength controls guarantee that the brewed espresso is to your exact standards. Finally, the automated milk frother will provide world class foam for any cappuccino or latte. All in all, this machine promises the absolute best beverage every single time. With a high customer satisfaction rating, the ESAM3500 N Magnifica is a good choice for just about anyone. The all-in-one design of this unit means that it will take up minimal counter space for the job it performs. The combination of grinder, brewer, frother and warmer makes this model ideal for even the smallest of kitchens. 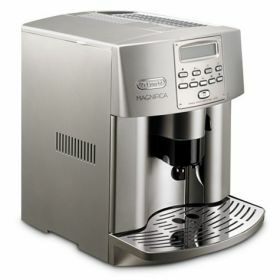 Additionally, the fully automated nature of the Magnifica means that even the novice can make barista-quality cappuccinos or lattes. Now you can have your favorite coffee shop beverage without having to leave home!